Is a flock of 15,000 crows a burden or an opportunity? 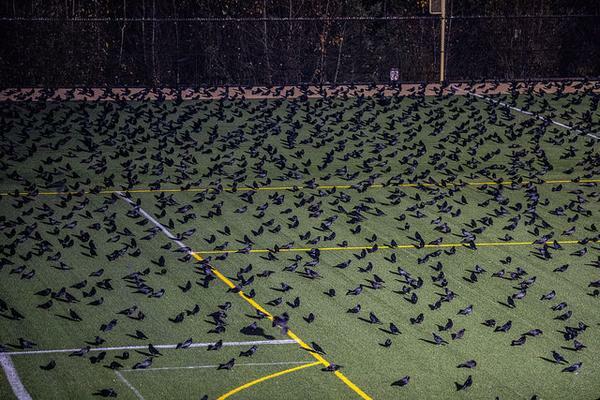 At the University of Washington, Bothell it’s an opportunity for a groundbreaking study on crow communication. 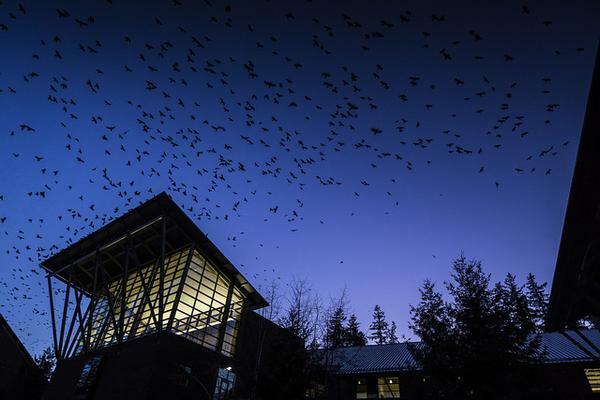 Every year from fall to spring, 15,000 crows gather on campus on the way to their roost in the North Creek Wetlands. These gatherings are their noisiest time of day. Crows are intelligent so chances are good that they’re saying something meaningful — but no one knows what it is. Last year UW Bothell biologist Douglas Wacker and acoustics expert Shima Abadi decided to team up and find out. Working with a group of students, they tested audio equipment and the crows’ reactions to it. They also wrote software to find the most interesting parts of the crow conversations so researchers don’t have to wade through hours of recorded caws to find the best parts. Setting up the equipment was not as simple as you’d think. Crows are wary of changes in their surroundings so audio equipment was introduced carefully on the rooftop of Discovery Hall, a building where the crows congregate. By the time this photo was taken, the crows were cool with four audio rigs on the roof. This winter Wacker, Abadi and their team of students will learn more about crow communication and pair it with video to determine who’s saying what. What are the crows saying? Soon we may know. 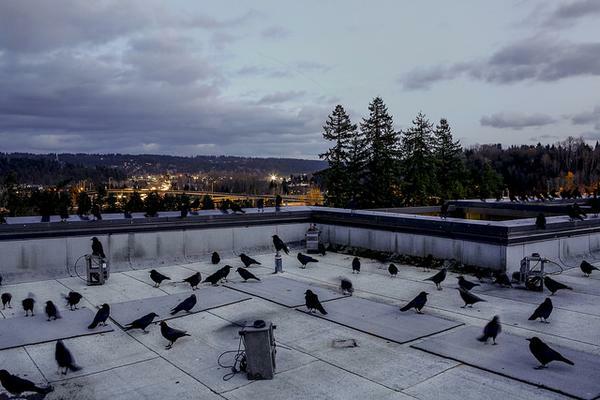 Read more about the study and see a video of crows on the roof in this article from the University of Washington, Bothell: Rooftop Wiretap Aims to Learn What Crows Gossip About at Dusk. Exciting! I have followed your posts about them, Kate, and have become so aware of them and their personalities. We love it when they fly around high over our large trees and stir up the other birds. Such chatter! Hope we learn more about their conversations, soon.